What is a pic microcontroller? The PIC microcontroller is a low cost ‘computers on a chip’ manufactured by Microchip. They allow electronic designers and hobbyists impart intelligence and logic to a single chip for special purpose applications and products. The PIC microcontroller programming is done using the popular software ‘Mikro C’. 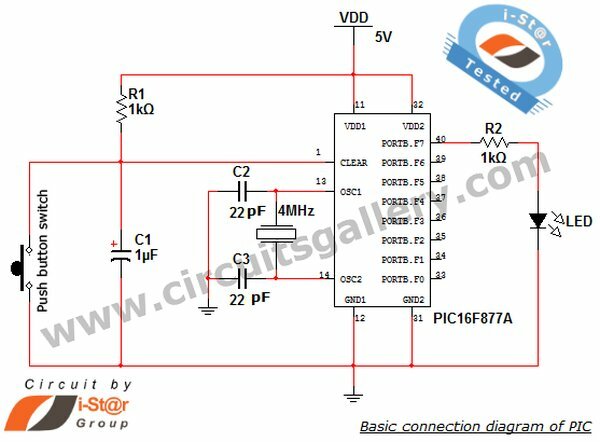 This powerful yet easy to program into a 40-pin package is upwards compatible with the PIC16C5X, PIC12CXXX and PIC16C7X devices. How to program microcontroller? Which is the program for microcontroller? These are the commonly asked questions by microcontroller beginners. Here we are going to explore the world of microcontroller, microcontroller programming and embedded systems with PIC16F877A. It is has five ports- port A, port B, port C, port D and port E.
An embedded system design is easy with the help of embedded C programming. Let’s start studying about microcontroller and embedded C programming for microcontroller PIC using Mikro C Pro. 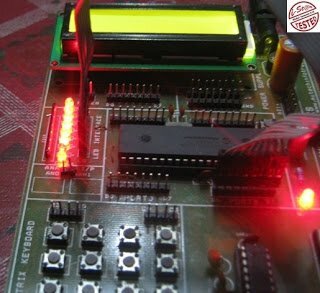 This article deals with the basic connection diagram and a LED blinking program of PIC microcontroller. Why PIC is used/ Why PIC is Popular? All are single cycle instruction excluding for program branches. Operating speed is DC to 20 MHz.